It was the summer of 1986 and my family was on our way to Germany for another life changing move with the Air Force. After a rather unpleasantly long plane ride (Especially for my mother, with 4 children. I have so much more appreciation for my mom now that I'm a mother. ), followed by a long drive, we finally arrived at our new home...Hahn Air Force Base. We would be staying at the on-base temporary housing unit until we found a place to live off base. We were tired, jet-lagged, and incredibly hungry. One of my dad's new employee's, endearingly known as "Pop's", offered to take us out for a traditional German dinner. He took us to a little restaurant right off the base in the little town of Sohren. That's where I was introduced to Jagerschnizel! 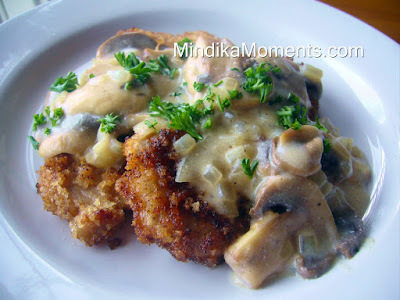 An amazing dish of pork with mushroom sauce. That night I would have told you Jagerschnizel was the best thing I had ever eaten. And maybe it was, or maybe I was just that hungry. But I have been in love ever since! Some time ago I decided I needed to learn how to make Jagerschnizel. After searching the Internet for a recipe, I came up with the following. It is a combination of several different recipes I found, and a result of some trial and error. What I discovered is, that much like America Apple Pie, every family in Germany has their own variation or secret recipe for Jagerschnizel. And while I'll probably never be able to exactly replicate the first taste I had that summer night in 1986...my version comes pretty darn close. It was sooo good that my mushroom hating husband gobbled up 2 helpings, with much praise and permission to repeat any time I like...trust me...that's saying a lot!! 1. Pour the bread crumbs into a shallow dish. Season the pork cutlets with salt & pepper, then dredge in the bread crumbs. 2. Heat oil in a large skillet over medium-high heat. Saute the pork in the oil for about 5 minutes per side or until the pork is cooked through. 3. Remove the pork form the pan, transfer to a platter and keep warm. 4. Remove any burnt bits from the skillet. Over medium-high heat, melt the butter in the skillet. 5. Add the onion and mushrooms, season with salt and pepper. Saute for 3-4 minutes until the onions are translucent and the mushrooms have released their juices. 6. Add the chicken stock and continue cooking for several minutes until the mushrooms are soft and the stock has reduced a little. 7. Mix the sour cream and corn starch in a small bowl. Add the mixture to the pan and stir to incorporate. 8. Cook for 1-2 minutes until the sauce has thickened slightly. 9. Serve the sauce over the pork cutlets. You made this and my dinner?! you're amazing. Mm, that looks SO, so, SO delicious...love your story too ;] I love when families have their own secret food traditions, my husband and I have created a few already! I imagine this would go over very well with Grumpy also. Looks delicious!